This is the first completed painting in a new series I've started this past month. 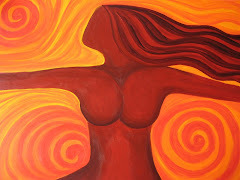 The series is titled "Force of Nature: Womanspirit Revisited". 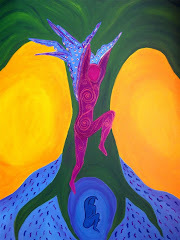 This painting is a key part of the series and titled "Force of Nature". These paintings evolve out of my life experiences and work that I first explored some 15 years ago. I have the ideas for over a half dozen paintings in my head. Now the work is in transferring those ideas onto canvas using paint. Here's the painting at the beginning. I start by blocking out the shape of the figure with paint. Next the background color is laid down. I continue to work on the painting, frequently stepping back and looking at the shape, colors...the middle stages are the hardest, the time when the doubts that I'm on the right path are the strongest...will this come together as the vision in my head? It's getting there...but I'm still looking for the painting to express the energy, that "force of nature" I am searching for. I push past the doubts and keep painting. Finally, it all comes together. She is a "Force of Nature". This powerful woman represents every woman (including myself) I know that has pushed past every obstacle that comes her way to reach her goal, to be her true self. As women, I don't think we are always in touch with that powerful force inside us. We may not even realize it is there. Sometimes it only seems to kick in when something ugly and destructive comes our way. Mess with our kids, threaten our bodies or livelihood...and that "force of nature" becomes a true force to reckon with. I have already started working on the next painting in this series. But I think this painting will always remain a favorite. I have also decided that this is the painting I am entering in the State Fair Fine Arts Competition. With any luck, I'll be able to share this "Force of Nature" with lots of folks visiting the fair. Well, I finally got some pics uploaded, so I thought I'd throw out there some pics of necklaces that I've recently completed. I enjoy working with the seed beeds, playing with color and beads of various sizes and shapes. I am also trying to bead necklaces of various lengths. Some days it is nice just to finish a project that has a beginning and end--and one that can usually be finished in an evening. I'm feeling a little bummed tonight. I got a rejection letter from the art crawl's poster competition. In a way, I was bracing myself for rejection by trying to expect that outcome. Doesn't matter. Like any other artist (or person for that matter), I appreciate positive outside validation. It's nice to get that pat on the back that tells you that you're doing good work. It's hard too because I see so many of the same artists get selected every crawl that I wonder if it's just a "political" process or if my work is that far off the mark. But it is what it is, and I'm not about to let it discourage me. In fact, I plan to keep submitting and even work harder at getting my work exhibited outside of my little studio. It's been a long--very long month. First, I had a bout of salmonella--yup, the same salmonella that's part of the nationwide outbreak. It was some nasty stuff and pretty much knocked me out of commission for a few weeks. Then I had a family emergency to tend to...and well, there's not been a lot of time in the studio. Finally, last week I was able to get back to the studio. I started work on a painting that I plan to submit to the State Fair Fine Arts competiton. In fact, I have the painting registered for the competition. It's a simple (and free) entry registration for the competition. Any Minnesota artist can enter one piece of artwork. You register the artwork online and then drop it off for the jury to review at the beginning of August. I'm not really expecting to be selected, but entering is something I've always wanted to do. Now that I know it's so easy to enter, I think I'll be trying every year. I will post some pics once I have them uploaded.